Circa 1840, this Ayrshire gown is certainly a work of art! The design and quality of the satin stitch embroidery is of the highest order. The skirt panel is encrusted with the finest embroidery, and combined with the quality of the drawnwork and fancy needle lace fillings produce a gown that is well worthy of being in a museum collection. A work of art! This is a gown that has the very best Ayrshire embroidery. The design is opulent, the skirt heavily encrusted with superb work that tapers from a wide area at the bottom, with whitework flowers and leaves climbing to the top of the panel. 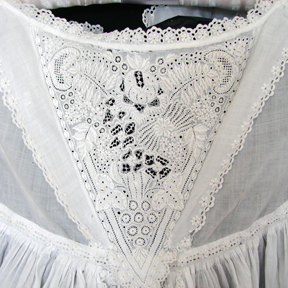 A elaborate bodice and five ruffles of whitework on the wings of the gown. The very best of Ayrshire work! 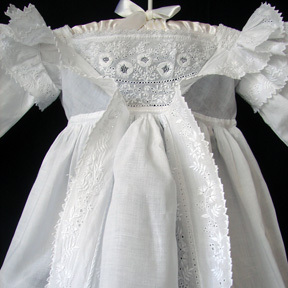 A wonderful Christening gown! One of the rarest designs I have seen on a Christening gown. 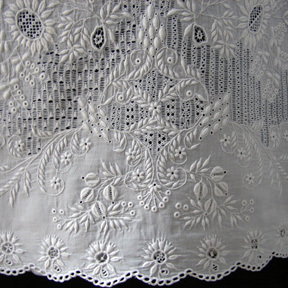 There are masses of whitework insertions with garlands of flowers alternating with Valencienne lace insertions. A heavilly worked bodice with elaborate pintucking, feather stitching throughout the gown. 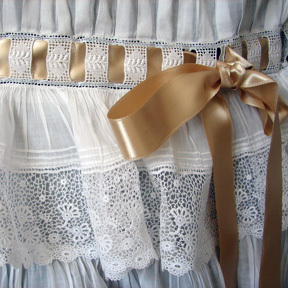 An enchanting period girl's dress with layers of lace, pintucking, and ribbon insertion. A adorable dress! 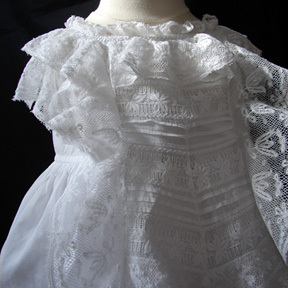 Beautifully handmade with the tiniest pintucking and lace. A wonderful dress for child, doll, or collector. Circa 1700's, a wonderful Hollie Point Christening bonnet with a design of urns and flowers. It is known also as "Holy" Point. 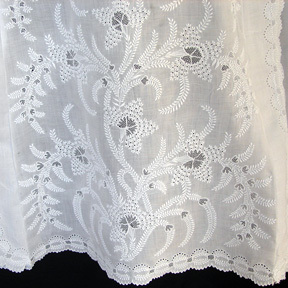 This lace is one of the most highly collectible laces, used mainly for Christening gowns, bonnets, etc. Circa early 1900's, this is a exceptional dress, with masses of Broderie Anglaise, feather stiching, and Valencienne lace. The design of "Boteh" on the skirt reflects the fashion in paisley's during this period. This gorgeous dress has everything, the design is extraordinary, and the level of workmanship is superb. An outstanding antique Ayrshire Christening gown with a profuse amount of the most delicate and fine whitework embroidery. The ornate design of elongated leaves and flowers are abundant throughout the gown. The quality and quantity of the embellishment is outstanding. 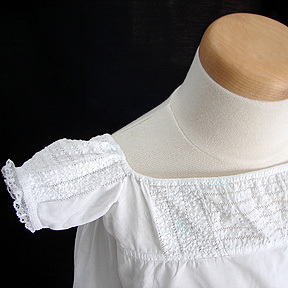 Circa 1900's, a very sweet child's dress with fine pintucking ribbon insertions and very pretty Valencienne lace. 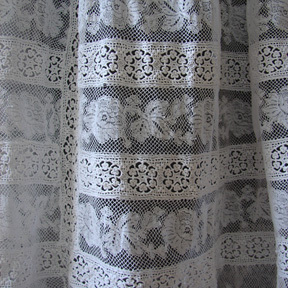 The design on the Valencienne lace is fine and elegant with a very pretty openwork insertion. 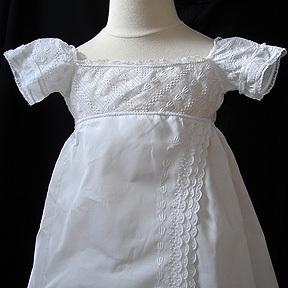 A lovely whitework Christening gown with a superb quality of whitework. Dated 1860, the style is reminiscent of the fashions at the time. The elaborate bodice and sleeves have been heavilly embellished with the finest embroidery, with ornate whitework on the wings and scalloped edges. A wonderful gown for the baby or for the collector. There is exceptional Ayrshire work on this lovely child's dress. Both the bodice and skirt have full ornate whitework with tiny daises embroidered along the wings and hem. The embroidery is truly exceptional! 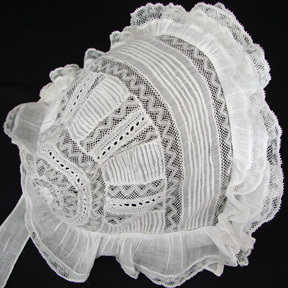 A exceptional Christening bonnet with a profuse amount of embroidery. 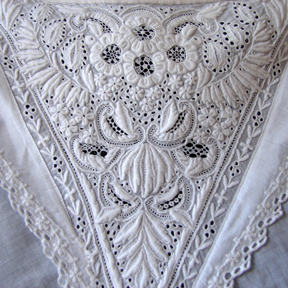 The quality of the whitework embroidery is of the highest order and the amount of work is quite amazing. 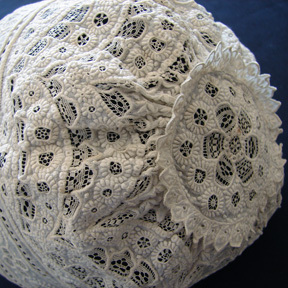 A rare bonnet, well worthy for a museum collection or for the whitework collector. Circa early 1800's, a fine and delicate design on this empire neo-classical gown. Tiny embroidered flower garlands, three-dimensional raised-work, elegant drawnwork, and Valencienne lace trim adorn the bodice and sleeves. A elegant gown! 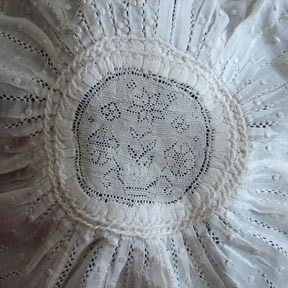 This lovely bonnet is entirely covered in Ayrshire whitework. Most astonishing is the tiny various needlepoint lace fillings that are all totally different. A amazing amount of work went into this lovely bonnet and it is quite rare to find one as heavilly embellished with Ayrshire lace. Wonderful for baby or for the collector. This is a truly superb Ayrshire boy's Christening gown. Robes for girls had the "V" of the bodice tucked in, and for the boy the "V" was left on the outside of the bodice. The finest linen was used on the very best gowns. The Ayrshire embroidery is magnificent on this early 19th C. gown. Both the bodice and the skirt have opulent Ayrshire work, with embroidery on the two wings and bottom part of the gown. 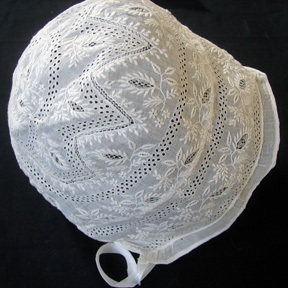 A lovely fine bonnet with a ornate design of whitework embroidery, drawnwork, pintucking, and masses of Valencienne lace insertions. Also seen on the lovely ruffles framing the face. A lovely item for doll or baby. 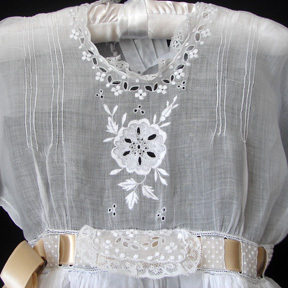 Circa early part of 1800's, a gown with a rare design and excellent whitework embroidery. These early empire gowns are always rare to find, and this one is particularly impressive. The fashions of the early 1800's were supremely ethereal and elegant. 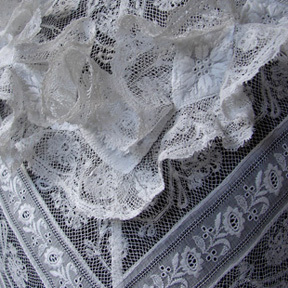 A beautiful lace 19th C. handmade Valencienne lace Christening gown. 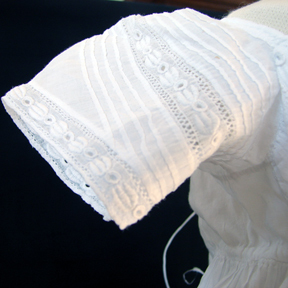 There are cascading ruffles of lace alternating with pin-tucking and whitework. Lovely wide Valencienne wings complete this superb frothy and ethereal gown. 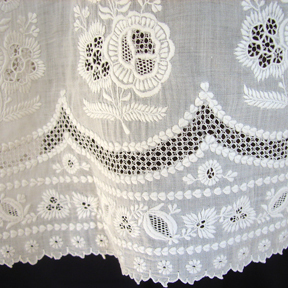 Circa 1890-1900, a superb example of a period dress, with masses of whitework insertions and decorative Valencienne lace. The neckline and waist has additional frothy ruffles of Valencienne lace, and there is a wide scalloped broderie anglais lace on the bottom of the dress. A stunning girls dress, this type of dress and size is extremely rare to find. A beautiful Ayrshire child's dress! Very fine whitework embroidery on the ornate skirt panel, bodice, sleeves, and all along the side panels of the skirt panel. 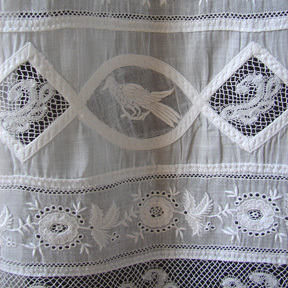 The wings and edges of the dress all have delicate whitework embroidery on the scalloped edges. 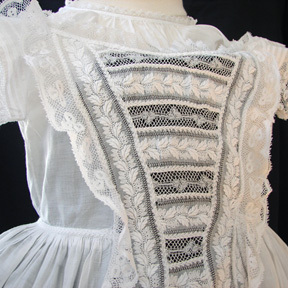 The bodice is also heavily encrusted with work, and the sleeves have ruffles with embroidery. 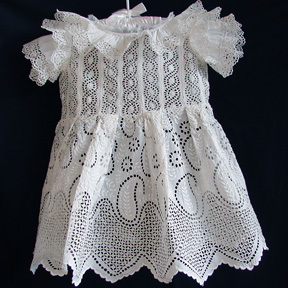 A delightful little girls dress with whitework embroidery, Valencienne lace and ribbon insertion. This sweet dress has ornate work on th ebodice and sleeves with a more heavily embroidered skirt. Tiny pintucking, hand covered buttons, and a very pretty spotted lawn insertion. A very beautiful neo-classical gown! Circa early 1800's, the empire gowns are always so very elegant, with a simplicity in the design. This fine gown has pin-tucking, drawnwork, and whitework embroidery that is also repeated in the ornate sleeves and wings. Superb design and excellent workmanship.